Star Games Casino has been servicing thousands of satisfied customers since 2008. During this period the online casino has established a proven track record. It’s licensed by the Lotteries and Gaming Authority of Malta and operated by Europe Entertainment Limited. One of the features that strikes me about the operator, aside from its instant play software is that it’s powered by Proprietary software (developed in-house), Evolution Gaming, GreenTube and Novomatic. The game variety is segmented into a nice table game variety (blackjack and roulette variants), video poker, towering jackpots, live casino, bingo and slots. It’s pretty evident that the majority of the casino games are made up of slots machines. But the software that steals the show, for me at least are the Novomatic 3D slots. They’re flushed with colourful graphics which simulates those found in a land-casino. So, from an entertainment perspective I’ve ticked all the boxes. If you’re a new player and you want to prolong your playing time by trying out the various games. Star Games casino offers you a once-off sign up bonus of 100% up to $100. To qualify for the bonus you must deposit a minimum of 15 credits. I might add the play-through attached to it is unique in more ways than one. How come? Before a cash out can be made the bonus received must be equal to the amount of games played. In other words the wagering amount equals 1 time the bonus. How does it work? Joshua deposits $50. Star Games credits his account with an extra $50. He can now play with $100. But before he can withdraw his winnings he must roll over the bonus $50×1=$50 and play at least 50 games. The weighting of the bonus is slots centric (100%) since it can only be used to play slots machines. Gambling can become addictive if not kept in check. Please understand it’s not the operator’s responsibility to curb your problem gambling habit. Like any other business it’s main prerogative is on profit and at the same token to provide a memorable gaming experience to its customers. Having said that, it does offer responsible gambling tools such as deposit, session limits and a self-exclude option. If you click on the ‘responsible gaming’ link at the footer of the site, you’ll see the various self-help and assessment tools at your disposal. Although support is available around the clock, 365 days per year, it can only be contacted through email or telephone. Regrettably a live chat text facility is not available. Star Games endeavours to respond to all email queries within 12 hours and sooner. An additional feather in its cap is that support offers ”native-tongue translation” since it caters to players from across the globe. It has a leg-up in achieving a world-wide marketing presence and name recognition. If you need a quick overview on what the casino has to offer. Click on the frequently asked questions tab it covers topics such as ”Games”, ”Promotions”, ”Loss of Connection” and ”Registration”. Today everything is virtual. This is why it’s important that a cyber casino inspires consumer trust and confidence. If the site does not offer it, players will move on and find another place to gamble. To ensure that a player’s private details stays protected, Star Games uses the latest SSL encryption software powered by DigiSert SSL validated by Europe Entertainment Limited. Unfortunately it does not list the audit report which outlines the average payout ratio of each game. Neither does it list the company which audited its software. Compliance with laws in the country of operation (Malta). Consumer privacy and prohibiting minors from gambling. In summary. With its extensive software and game variety, Star Games offers a bit of everything. Although the sign up bonus offered to new players is one-of-a-kind it sorely lacks additional promotional offers. Also, one would expect and operator of this calibre to have a live chat and VIP program. Recommended. Aside from the standard deposit bonus of 100% up to 100 credits. 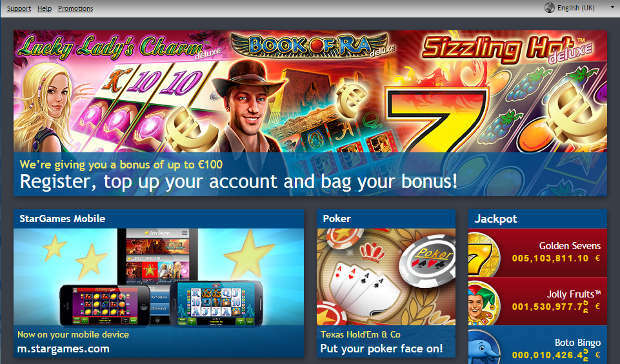 Star Games offers a refer-a-friend bonus of €10 for every friend you refer. The bonus will only be paid if the person (friend) you referred deposits a minimum of 10 credits and plays 10 games or more. Star Games offers a healthy selection of deposit and withdrawal methods. Before you can play you must deposit $15 or more. Withdrawal requests through ewallets are processed within 24 to 48 hours. Credit and debit cards can take anything from two to five days and bank transfers up to a maximum of 7 working days. ”The minimum acceptable deposit amount is €10. The company reserves the right to amend the limit or arrange for additional and repeated examinations on deposits at its sole discretion. Furthermore the maximum amount that can be credited into a gaming account per month is €10,000. Of course, the exact maximum amount also depends on the payment method chosen by the user. Copy of a valid passport, ID or drivers license. An additional ID check is carried every time the player requests a withdrawal that exceeds €300. Just keep in mind that manual flushing is not allowed. At the heart of any online casino operation is its games. If the games are sub-standard players will venture somewhere else and the operator will not remain in business for long. The instant play software (Flash) utilised by Star Games is immersive and impressive. And I might add it’s expensive. It’s also a good indication that the operator is financially sound since it can afford a variety of software platforms (already mentioned). I must warn you it’s important to keep your eyes on the live casino games you’re playing and not on the dealers. Reason being they’re just as hot as the games. Here you can play a variety of live blackjack, roulette and three card poker. They’re interactive since you can chat to the live dealers and to fellow players thereby creating a social environment. The games are streamed to your computer from a live studio via webcam which simulates a ”real-world” casino environment. You can see the cards being dealt or the ball being spun as such it instills player confidence. One key area of convergence between the ”real world” and the online casino is the branded slots. It’s the Novomatic slots that steals the show. As a software brand, Novomatic is well-known in land-based casinos the world over. Adding the games players already have a connection to in the ”real world” gives operators a competitive edge. Games like The Book of Ra, Sizzling Hot and Lucky Lady’s Charm have been an instant hit with players since their release. They come with a myriad of bonus rounds (free spins), scatters, wilds and multipliers.